It did not take long for me to notice that the people of Japan love food. They always seem to be eating or snacking on something, and whenever you talk to someone it does not take long before the conversation turns to food. They are very curious to hear what we eat in Norway, as well as to hear what I have eaten in Japan. 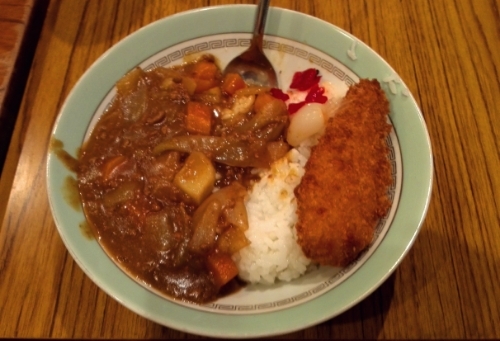 In fact, whenever I visit a new place in Japan, the first thing my Japanese friends ask me is what I ate there. Japan is truly a food loving country, how the people keep so thin baffles me. Most of the time I have been in Japan I have eaten at restaurants. Either I am out walking by myself, or I meet friends over a meal and some beers. Japanese apartments are usually small, there might not be much room to invite people over. Most of the socialising takes place at restaurants and bars. I have had so many great meals in Japan, both at Japanese and Western or other Asian restaurants. In fact, the best burger of my life I had in Nagoya. You do not have to walk many meters to find a restaurant serving some of the best food you have ever tried. At least it feels like that when eating. I was on a skiing trip in Niseko, on the northern island of Hokkaido, together with a group of Japanese friends. Every morning we would wake up early, head for the slopes. Ski or snowboard for hours. When we finally were done, cold, frozen, tired, we would sink down into the onsen, the hot spring, such a great feeling after hours out in the cold. Just relax in the hot water, chat, let the sore muscles get some rest. After about an hour in the onsen we would get up, get dry and head back to our lodge. Back at the lodge it was time to cook supper. As the guest it was not expected of me to help, I could retire to the living room, open a can of beer, sit down and relax, watch some TV. The others started cooking. It did not take long before the most amazing smells started coming from the kitchen. Fresh, homecooked Japanese food. The smell was amazing. The Japanese really love their food, really love to eat. Even as they started preparing supper they started snacking. Potato chips, small pieces of fried chicken, moshi, different Japanese snacks I don’t know what was. They kept nibbling away as the food was prepared. How they could still have room for food I have no idea. How the Japanese stay so fit still baffles me. Their apptite seems to be endless. I remember watching a TV-show one evening in Japan. These tiny Japanese girls would travel to the US for eating contests with these massive Americans. It looked like the Americans could eat the Japanese girls and still have room for dessert, but when it came to the contest it was surprisingly even. The petite Japanese girls would just start eating away. Slice after slice of pizza, and when they finally had to give up, after about 25 slices, the American guy managed one more, and realised they lost, the girls would break down in tears. Come on, you lost by one slice to a guy five times bigger than you, and you are so disappointed you cry!?! I was hugely impressed. The homemade food in Niseko did not disappoint me. The first night we had Nabemono, a Japanese hot pot. Popular during the colder winter months. 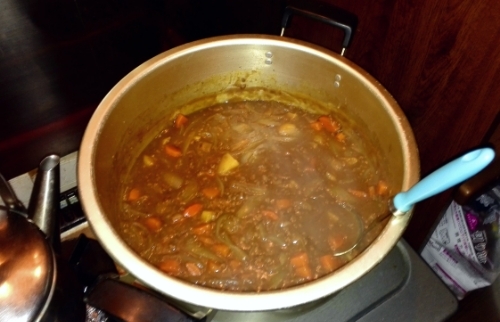 A tasty stew filled with all kinds of delicious food. Different kinds of meat and vegetables, some sausages, plenty of bacon. Cooked to perfection and served with rice and fried chicken on the side. All washed down with Sapporo Beer. It was delicious, I kept eating long after I was full. I was not allowed to do the dishes afterwards either, was simply told to relax in the living room. The second day I was served a curry. Equally delicious, equally tasty. I ate and ate, could not believe how lucky I was. Sitting in a small cabin out in the countryside with nine Japanese friends, far from the busy and noisy cities of Japan, eating the most delicious home-cooked food. Then followed an evening of card games, chatting, drinking and simply having fun. It was an experience I will always remember, a true Japanese experience. Nothing touristy about it. 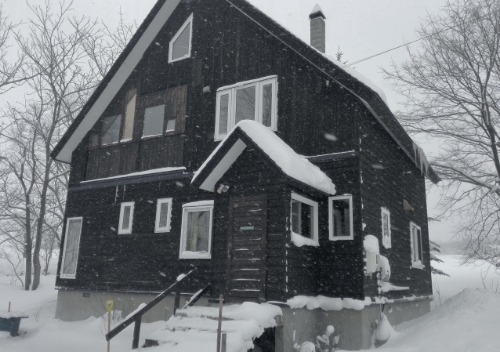 When I first went to Niseko I was a bit anxious. I only knew one of the people I was travelling with in advance, I am not always the best with a lt of new people around me. Not socially awkward, simply a bit shy and quiet until I get to know people. It turns out I had nothing to worry about. I made a lot of new friends on that trip, had a great time skiing, but the thing I will always remember from that trip is the meals. Delicious home-cooked Japanese food, shared among friends in our own little cabin far away from civilisation. A memory for life. This entry was posted in Japan and tagged food, friends, Niseko, skiing on April 27, 2017 by Traveltorgeir.